[theflyingguy] Although this airport is not cheap, service is great. Ground staff are friendly and helpful with parking, customs, fuel, etc. And of course, the approach is spectacular! [deadstick] Interesting approach, good fuel service, friendly people. Bring your foldable bicycles and enjoy the ride from the airfield at 500 m elevation down to Bol at MSL. If you want to continue to Italy from here you can include the tiny Croatian island of Palagruza and the tiny Italian island of Pianosa in your course. [pierluigi] 07.08.2015 friendly and fast service!! [pilatusflyer] Expect turbulences and possible sharewinds during final, specially if you approaching Rwy 04! Handling is great! Excellent service! Landing after airport operation time costs you at least 50.- Euros. Taxi to Bol is about 26.- Euro (15min ride). I recommend restaurant Mandalei for dining! great and cheap food. Several appartments and hotels available. [philippevd] Nice airfield at 1770ft, top of the island. Beautiful approach. Friendly and efficient staff. [sxarf] Very suitable GA airport with a good 5 day relax time to spend.Take many pictures on the island. Transportation organized by handling staff to Bol (~10 km winding road). [joc] The actual field altitude is 1780 feet, but be careful to properly calculate the density altitude, especially during hot summer days. [blacksheep] Airfield at 5000 feet!!! Watch out,calculate CAREFULLY your density altitude, especially on a hot summer noon take-off. Nearby BOL has excellent beach. [glp500] Single < 2 to. PA28 EUR70 for landing, handling and 2 nights parking. [philippevd] Single < 2 to. 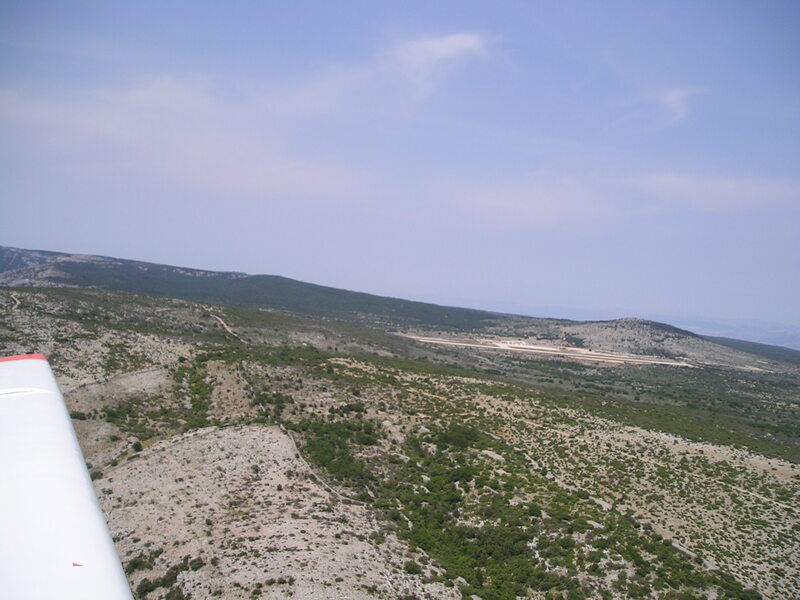 AA5 32euro for technical landing (includes 25% discount) Not cheap for the area! [sxarf] Single < 2 to. C172 70 euros for 1 week & 35 euros for each transfer to farthest village Airport van provides transfer/No car rentals or taxis outside ! [mosi] Single < 2 to. P28R LDG & Handling 31 Euro, 2 nights Parking 14 Euro, Transport to Bol 18.20 Euro Credit Cards ok. 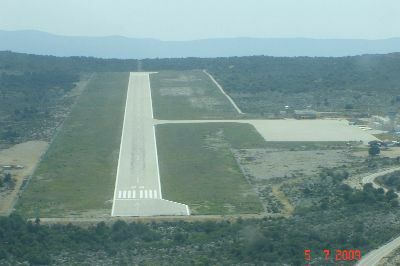 Approach to land RWY 22, Brac.